Harris County Clerk Stan Stanart reminds Texas voters who cannot obtain one of the seven forms of approved photo ID that they now have additional options when voting in person. As provided by a court order, if a voter has a reasonable impediment to obtaining one of the seven forms of approved photo ID, the voter may vote by (1) signing a declaration at the polls explaining why the voter is unable to obtain one of the seven forms of approved photo ID, and (2) providing one of various forms of supporting documentation. Voters with a disability may continue to apply with the county registrar for a permanent exemption to showing approved photo ID (which now may be expired no more than four years) at the polls. Also, voters who (1) have a consistent religious objection to being photographed or (2) do not present one of the seven forms of approved photo ID because of certain natural disasters as declared by the President of the United States or the Texas Governor, may continue to apply for a temporary exemption to showing approved photo ID at the polls. 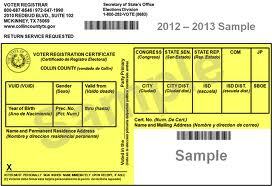 Voters can learn more by visiting www.HarrisVotes.com or by calling 713.755.6965. Early voting for the November 8 Election begins Monday, October 24 and ends Friday, November 4. Pay close attention to what Stanart is saying. The voter ID law was not thrown out by the Fifth Circuit. It remains in effect for everyone who has a driver’s license or one of the other forms of ID that had previously been accepted. What has changed is that if you don’t have one of those forms of ID, you can now sign an affidavit swearing to that, show one of the alternate forms of ID listed, and your vote will count. I repeat: if you have one of those approved forms of photo ID listed above, you must still use it. Stan Stanart has already made it clear that he will closely scrutinize those I-don’t-have-an-approved-photo-ID affidavits and the people who sign him. We are fools if we don’t believe him. Yes, the question of whether the Legislature intentionally discriminated by passing that voter ID law in the first place is still an open question. If the plaintiffs prevail, then the voter ID law will be well and truly dead. That hasn’t happened, and there’s absolutely no guarantee that it will. Until then, or until some other legal challenge puts a stake through the heart of these laws nationwide, you still have to show your driver’s license or the equivalent if you have it. Nothing has changed, so don’t act like it has. “cannot obtain one” and “reasonable impediment” are two different phrases. This slimy voter ID law has a single purpose. To obstruct, hinder and impede voters of a certain socio-economic strata statistically shown to not be white. So– if you use the new allowable forms of ID and sign the affidavit, is your vote via a provisional ballot or regular ballot? If provisional, then heaven help us. The lines will be insane at the polls. Is this detailed anywhere or does anyone know? Marianna – Under those conditions, it is counted as a regular ballot. That was the key to the agreement. One significant change is the expansion of acceptable expiry on six of the seven allowable id types from 60 days to four years. Don’t read too much into the County Clerk’s statement about vetting the affidavits of those who sign them. Any document completed and submitted by a voter during the process of presenting to vote is vetted by the CC, the VR, or both. Plus, those news releases appear to be boilerplate from the SOS, not individual county clerks.